Romelu Lukaku haunted West Ham United yet again as he netted twice on his Premier League debut for a rampant Manchester United in a 4-0 win on Sunday. 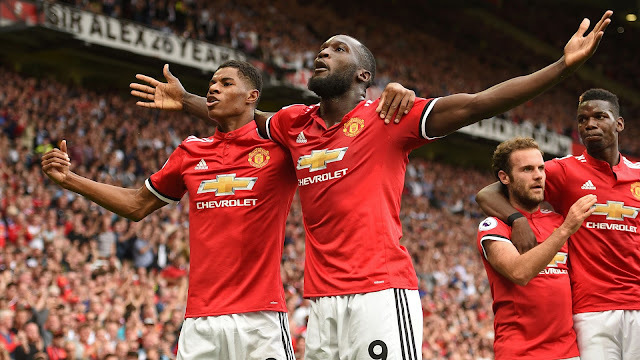 Lukaku netted either side of half-time before Anthony Martial and Paul Pogba completed the scoring against slow-starting West Ham, who lost their opening Premier League game of the season for the 11th time. The Belgian striker, who cost United £90m this summer from Everton, has now scored 11 times in his last 11 league appearances against the Hammers. United's main problem last season was scoring at Old Trafford as they managed just 26, which was two less than relegated Hull City. Lukaku was snapped up to improve that tally and took just 33 minutes to introduce himself to his adoring crowd. Marcus Rashford - lively throughout - sprinted at the heart of the West Ham back four and slipped a delightful ball through to the Belgian, who smashed a first-time effort past Joe Hart via the inside of the post. Lukaku didn't have to wait long until after the break to double his league tally. Mkhitaryan clipped a free-kick into the box from the left and Lukaku rose ahead of his marker Arthur Masuaku, who seemed to be sharing a joke with the striker before the ball was played in, to glance home from eight yards out. West Ham almost replied instantly when Edmilson Fernandes' cross found Marko Arnautovic, who got the wrong side of Daley Blind, but his header was tipped onto the crossbar by David de Gea. That was as good as it got for the visitors as they struggled to get former United man Javier Hernandez into the game on his full debut.